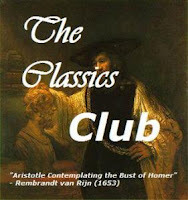 I would like to welcome the Classics Circuit and everyone else for a special post I am making today about a phenomenal little book. I have very limited experience with Russian literature as a whole. For me, the Russian authors have always been super intimidating. I never had to read any of them in high school or college, and so I built up this mysterious aura around them and their work. 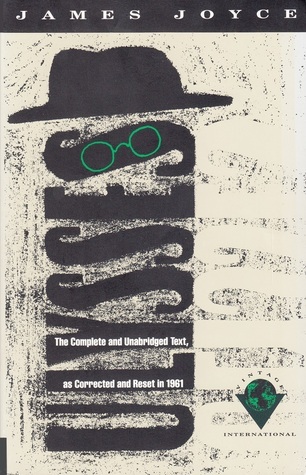 I decided to jump in and read Crime and Punishment by Dostoevsky as the second book for my little challenge. Imagine how surprised I was when I realized I was in love with the book after 80 or so pages! I also read The Brothers Karamazov back in April and that too was a book I fell in love with! While I wasn't ready to tackle Tolstoy yet, I did decide to read Fathers and Sons by Ivan Turgenev, an author I hadn't heard a lot about. And after finishing it, I really am in love with these Russian authors. They have the ability to turn simple stories into great beautiful works that are just so powerful. They just continue to surprise me when I pick up a volume. Fathers and Sons is a story about the relationships between young and old. The young seek progress and change while the old hold on to tradition and the way things have always been. The main focus of the book is on two young men returning to the Russian countryside from university in St. Petersburg. One of them, Arcady Kirsanov, is slightly more traditional than the other, but finds much to value and love in his friend. Bazarov is an extremely intelligent young man who essentially believes in nothing but progress and straying away from tradition and traditional Russia. 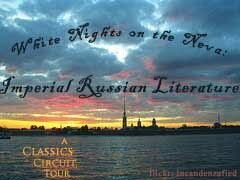 The novel portrays their story as they are thrust back into traditional Russian life and all that it has to offer. Arcady returns home to his father and uncle to visit and explore, and show what he has learned while at university. Bazarov comes with him and immediately sparks ignite as he begins arguments and quarrels against the social conventions of the home. When Bazarov eventually returns to his home, the reader can see that he did come from a very loving and wonderful home. His parents are overjoyed to see him and almost smother him with their pride and love. Those scenes with his parents are what truly touched me in this novel. Bazarov maintains his somewhat negative attitude and isn't at all grateful for the things his parents are doing for him. Instead, he leaves only a couple of days after he arrives. I don't want to give any more of the plot away, since it is simply wonderful and I feel like you need to read this one yourself. But I still touch on a lot of the meaning behind this book. I love how Turgenev shows how at first, progress and change are wonderful things. They bring enlightenment and new ideas. But there is something to be said for tradition. Tradition works for some things, and sometimes, it might be best to keep traditions held tight. In a larger scope, you can tell that this novel is a reflection of the time period. Since it was first published in 1862 and Russia was going through many changes along with the rest of the world, you can see the reflections in the way the characters speak to each other and interact. It was a time of large change in Russian society. Old traditions and classes were dying and the people of the aristocracy had to adjust. Where Gone with the Wind touches on the changes made here in America, Fathers and Sons touches on the changes in Russia. And it does so with beautiful language. "Time, as we all know, is sometimes a bird on a wing, and sometimes a crawling worm; but men are happiest when oblivious of time's quick or slow pace," (106). "'I have behind me so many memories: my life in Petersburg, prosperity, then poverty, my father's death, my marriage, my trip abroad, it had to be...There are plenty of memories, but nothing to remember, and ahead, in front of me, stretches a long, long road, but I have no goal...So I have no desire even to tread the path,'" (115). "'Yes, yes,' Bazarov began, 'let this be a lesson to you, my young friend, an instructive example of sorts. The devil take it, how absolutely absurd everything is! The life of each of us hangs by a thread, an abyss may gape beneath us at any minute, and yet we go out of our way to cook up all sorts of trouble for ourselves and to mess up our lives,'" (131). As a whole, the novel was very approachable and lovely. It is a story with such depth that I am still thinking about and will continue to. It has sparked within in me a love for the land of its origins, and the courage to try more of these wonderful Russian authors. And for those of you who were just as intimidated as I was, this would be a great place to start! 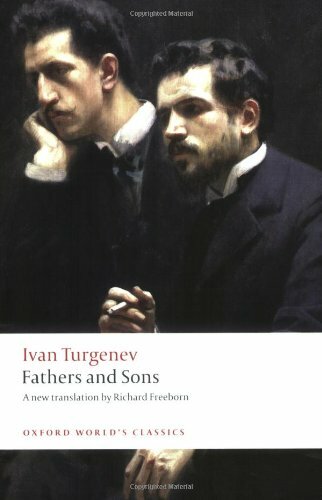 I have generally disliked most of the Russian novels I've read, but I did enjoy and take something away from Fathers and Sons. I loved Anna Karenina and I definitely want to read more Tolstoy; I also loved Yevgeny Zamatyn's We, which was apparently the inspiration behind 1984 and Brave New World. Sadly, I detested Crime and Punishment! I wanted so much to love it but I couldn't stand Raskolnikov (did I get the name right? ), he was so self-indulgent I felt nothing but contempt for him, and I couldn't get into the story at all. I completely missed the boat with that book, and it makes me sad. I want to know what it's like to love C&P! I still plan to tackle The Brothers Karamazov though. I'm sure it's just Raskolnikov that made the book such a struggle. I haven't heard of Fathers and Sons before, but I very much enjoyed reading about it here. I think I read this but I was probably 15 and since I don't remember anything I guess I need to read it again! I have LOVED most of the Russian lit I've read so I should really revisit this. It sounds lovely.